In July of 2018 the Spiritual Life & Faith Formation Commission merged with the Social Concerns Commission. The Spiritual Life, Faith Formation & Social Concerns Commission is made up of members from St. Martin Parish and members from St. Bernard Parish, plus four ex officio members, namely the pastor, the deacon, Director of Religious Education and the Youth Minister. This Commission initiates and coordinates the parishes’ ministry of helping individuals to grow in faith. It gives special attention to continuing education for each person and for the life of our parish families. It also looks at social teachings of the Catholic Church and getting information to the parishes and informing parishioners of any social issues that may arise. The Spiritual Life, Faith Formation & Social Concerns Commission meets the first Thursday of every other month. Several meetings are held for parents whose children are preparing for the celebration of First Communion and First Reconciliation. First Reconciliation is celebrated in the Fall and First Communion in the Spring. Contact Carolyn Thorpe at the cluster parishes office at (812) 649-4811 for more information. Confirmation is a two year program which normally begins in the Freshman year of high school. We do, however, have teenagers who start and finish Confirmation as Juniors and Seniors. Those to be Confirmed meet monthly between September and April and take part in a Confirmation Retreat in shortly before receiving the Sacrament. Please contact Carolyn Thorpe at 649-4811, if you have a student you would like to enroll as a Confirmation Candidate, or if you are interested in helping with this program. St. Martin’s has a Children’s Liturgy of the Word Ministry, which is a program for 3-, 4-, and 5-year olds. CLOW takes place during the 9:00 a.m. Sunday Mass. Children will go to the parish house and learn about the Sunday readings on their age level, and make crafts, draw, color and much more. The children return to the church at the Presentations of the Gifts. Parents are welcome to be present with the children and/or to lead this ministry on Sundays. For more information, contact the cluster parishes office at (812) 649-4811. Our religious education/formation program for Kindergarten to 8th grade takes place on Wednesday evenings from 6:00 to 7:00 p.m. in the parish house. For more information about this vitally important ministry, please contact the cluster parishes office at (812) 649-4811. No date has been set for VBS 2019. Freshmen and Sophomores participate in the Confirmation Program and Scripture Study. For more information contact Jessica Obermeier or Carolyn Thorpe at the cluster parishes office at 649-4811. St. Bernard and St. Martin Parishes believe that education in the Catholic Church continues well into the adult years of life. In fact, we believe that we can continue to learn about our faith, and our Father who loves us, until the day we go home to be with Him. In order to provide this education, we have had and continue to have programs in place to provide more learning experiences, and are constantly striving to provide new opportunities of continuing education.We have had Bible/Scripture Studies and Lenten Soup Suppers with various guest speakers and a variety of topics. If you are interested, please call the cluster parishes office. Marriage is so important to the life of the church and to the welfare of society that the Catholic Church supports those who are engaged. Married couples, trained to share their experiences with engaged couples, assist them as they begin their new life together. Engaged couples are to notify the pastor at least 6 months prior to their wedding so that the necessary preparation can begin. For more information contact the cluster parishes office at (812) 649-4811. The RCIA is the liturgical and catechetical process by which new members are initiated into the Catholic Church. Although designed initially for the non-baptized, the RCIA has been adapted to bring members baptized into other Christian traditions into full communion with the Catholic Church. The RCIA and RCIC programs are established for adults and children of catechetical age (6 and above) who are to be brought into the Catholic Church at the Easter Vigil through the reception of Baptism, Confirmation and Eucharist, or through the Profession of Faith, Confirmation and Eucharist. For more information contact the cluster parishes office at (812) 649-4811. The prayer chain offers support and prayers for special intentions submitted to our Parish. To request prayer for yourself or someone else or to join the prayer request group, please contact the cluster parishes office at (812) 649-4811. The Homebound Ministry delivers Communion to those who are unable to attend Sunday Mass. If you or anyone you know is in need of this ministry please call the cluster parishes office at 649-4811 or Deacon Mike Waninger at (812)660-0909. The Hospitality Committee makes home health care equipment available to members of St. Martin and St. Bernard Parishes as well as people from the community at large. Some of the equipment available includes wheelchairs, walkers, bath chairs, canes, crutches, retrievers, and bedside commodes. If you have a need for any of this equipment, please contact Sarah Buckles at (812) 362-7362. There is no charge for this service. The Bereavement Dinner Committee organizes dinners for families and friends of deceased parishioners. This dinner is held in the parish hall, usually after returning from the cemetery. If you would like to help with this ministry by donating a covered dish or helping to serve at the dinners, please contact Pam Sisley at (812) 362-8586. The Saint Martin I and St. Bernard Youth Ministry is for anyone in the sixth grade up to the twelfth grade. Most of the activities for the Middle School and the High School are separated. You do not have to be Catholic or from Saint Martin to attend. You do not have to be Catholic or from St. Martin I or St. Bernard to attend. We focus on fun, community service, worship, and spiritual education in a Christ-centered environment. For more information or to volunteer, please contact Jessica Obermeier at (678) 469-6645. Each Advent we invite people to take an angel with particular items written on the angel for someone in need. Contact person is Della Green. This ministry involves St. Martin’s sister parish, St. Ives Parish in Haiti. This ministry is funded by the St. Martin Social and is disbursed on a semi-annual basis to St. Ives. For more information, contact Karen Waninger at (812) 660-0890. This financial assistance is given to families who have lost their jobs, had an unexpected illness, accident or catastrophe occur in their lives. This ministry is funded by profits from the St Martin Soup Social. If you fit one of the situations above or are interested in assisting in this ministry, contact Karen Waninger at (812)660-0890. This cluster ministry involves raising awareness and money for cancer research and projects in Spencer County. Cancer Relay for Life event is the first week in June where they celebrate cancer survivors and those who have died from cancer. The contact people are Charlotte Weber at (812) 362-8190, Sara Kleeman at (812) 303-7649, and Leah Ambler at (812) 359-4132. Give them a call if you wish to participate or make a donation. The Liturgy Commission helps guide how the parish community worships and celebrates the Liturgy. In collaboration with the Pastor, the Liturgy Commission plans the seasons and feasts of the Church’s Liturgical Year, sacramental celebrations and other liturgical events. If you would like more information concerning this commission, please call the cluster parishes office at (812)649-4811 or Deacon Mike or Karen Waninger at (812)660-0890. In consultation with the LiturgyCommission, the Decorating Committee plans and executes the art and environment for the major seasons and feasts of the Church year. It also strives to produce a pleasing and prayerful atmosphere through the worship space during other times of the year as well. For more information, contact Karen Waninger at (812)660-0890. Here at St. Martin, we are proud of our choir, cantors, and instrumentalists. The adult Choir sings at Christmas, and on special occasions. Cantors sing at the 9:00 a.m. Sunday Mass and on Holy Days of Obligation, as well as other special occasions. We are currently looking into forming a Children’s Choir and use more instrumentalists. If you would like to know more about, or would like to become, a part of this fun-filled ministry, please contact Karen Waninger at (812)660-0890. “I don’t get anything out of Mass.” “Mass is boring!” Have you or your children ever thought or said this? If so, this is your chance to change that feeling! The church’s liturgical ministry gives members of our parish an opportunity to share their gifts and talents with their fellow parishoners, and to help enhance the liturgies. Liturgical ministers include Lectors, who proclaim or read the first two readings, sometimes the Responsorial Psalm and the Prayers of the Faithful. Greeters are the people you meet as you come to Mass and who pass out the bulletins at the end of Mass. Gift Bearers present the gifts of bread and wine during the Preparation of Gifts at the Parish Liturgies. Extraordinary Ministers distribute the Eucharist and the Precious Blood. 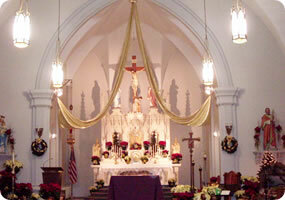 Sacristans are responsible for setting up the church for all weekend Masses and all Holy Days of Obligation. They also care for the sacred vessels, dishes and linens used for the Masses. Servers assist the priest and deacon at Mass. Children may become Servers as early as the Third Grade. Please contact Deacon Mike Waninger at (812)660-0909 for more information on becoming a Liturgical Minister.